Having read “the making of the Cretan landscape” and the “The Nature of Mediterranean Europe” we were expecting someone that would look and act like a British professor from Cambridge. He was so unlike that! With his signature orange socks and sandals and a white cotton summer jacket to frame quite fittingly his white beard and long untidy hair he looked to our eyes like the essence of the “eccentric Englishman”. But he was also so far away from the professors we knew until then! He was a naturally shy person, but also very generous with his knowledge, his experience and his time. One of us (Maria) was writing her ph.D. on soil erosion and she wrote a mail to him, in which he responded by mailing to her the proofs of the chapters of “Nature of Mediterranean Europe” which was not published yet. This was not only very welcome, but also an unusually generous gesture on his part. So, back to the field trip. He shared with us many intimate knowledge he had gathered around the Mediterranean in the last three decades of walking around. 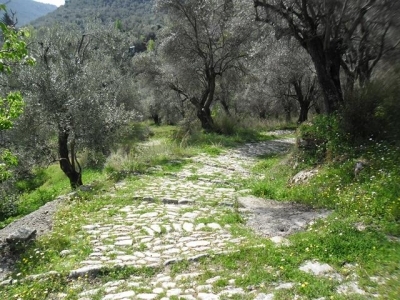 This included measuring the tree lines in a fallen tree nearby, commenting on freeze marks on olive trees, discussing invasion dynamics of American plants in the Mediterranean, soil erosion and catastrophe, terraces and many others. We had a few other opportunities to walk with him in the nature of Greece, all enjoyable, but none as remarkable as the first field trip. In one of these occasions he signed copies of his books in our library, which he happily did in Greek letters. We cherish these copies. The mail we received that Oliver Rackham passed away was titled “the fall of a great oak”. A very suitable title. Many more will comment his extensive work on trees and woodland and forests in England and the many books he has published on these subjects. We only wanted to share some thoughts on a great man, who is his own words (from his 2006 book “Woodlands”) was a “general practitioner of science”. Indeed. The fieldtrip that Oliver had taken over was indeed unique. So many stories to be revealed in a landscape. Well said. I was at the rear of that walk as well. Listening and trying to remember as much as possible. Sad.